As a Digital Ambassador, you will be empowering under-served individuals in the Dallas area, find and utilize opportunities to improve their well-being. 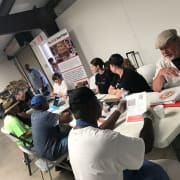 You will help people utilize computer and internet resources to connect people to opportunities in the Dallas area. You will facilitate connections with employment, job training, healthcare, shelter programs, food, clothes, and more. We are looking for individuals who have proficient computer skills, able to adapt to many temperaments, and quick on their feet. As a Digital Ambassador expect to facilitate employment opportunities, create emails, establish employment database profiles, job application data entry, establish voicemail services, and search local resources and locations. Proficient computer and software skills including G-Suite, & Office 365. A typing speed of 35 WPM or above. Ability to maintain tasks in a noisy and active environment. Please contact us to volunteer and make a difference.